Meteorological Spring will soon come to an end as we welcome in June tomorrow (Friday). The three month period of June, July and August are what meteorologists and climatologists refer to as Meteorological Summer. The Meteorological Seasons are based on annual temperature cycles, as well as on the calendar. Average temperatures at the beginning of June are in the upper 70's, ending the month with average temperatures in the low to mid 80's. 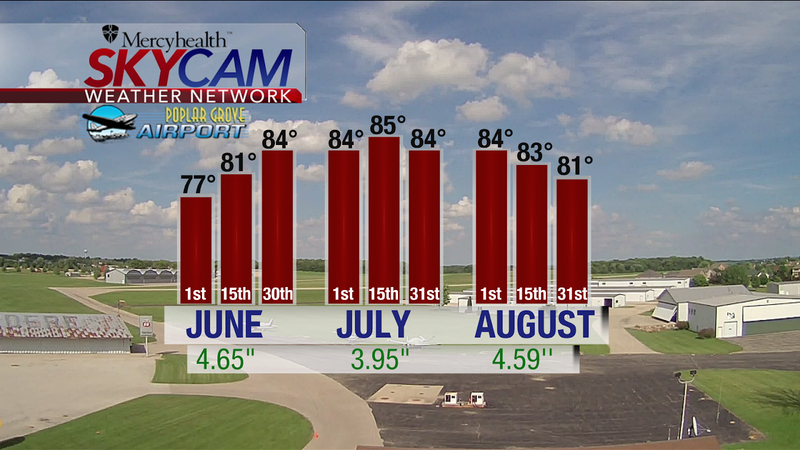 Typically July is the 'warmest' month out of the year with the average high peaking in the mid 80's. But we all know that the summer-like heat can occur anytime during the Spring, Summer and Fall (as we just experienced over Memorial Day weekend). 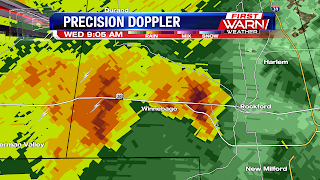 June is the wettest month out of the year for Rockford averaging 4.65 inches of rain. Monthly rainfall goes down for July due to hot summer days limiting thunderstorm potential. 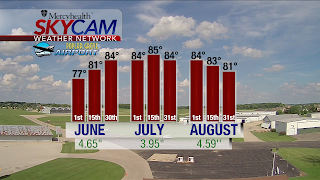 By August a downward trend in the temperature occurs as Meteorological Summer comes to a close. The rain that came down Wednesday morning and afternoon was heavy, producing anywhere between 1-3 inches in northern Illinois. There were several reports of flooding near Chicago during the afternoon and early evening. An isolated shower/storm is still possible overnight but the majority of the night will remain dry. Temperatures Wednesday warmed into the upper 70's and low 80's but will only fall into the upper 60's overnight. A little more dry air moves in by Thursday morning but dew point temperatures are expected to remain in the mid 60's during the afternoon. This will keep a slight humid feel to the air with highs Thursday reaching the upper 80's. 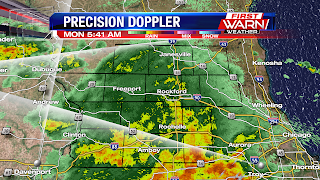 As of 9AM some of the heavier rain has made it over the northern half of the Stateline. 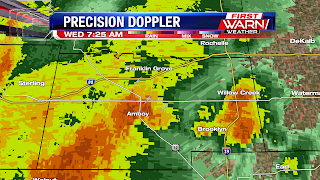 It is pouring at the station! 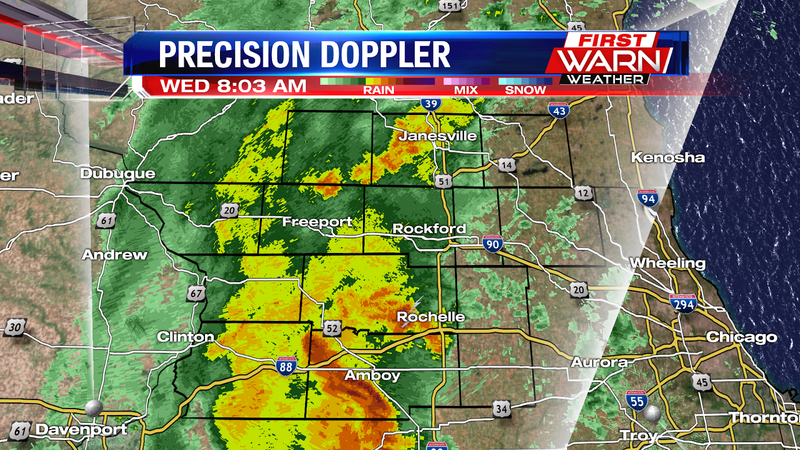 Very heavy rain just to the west of Rockford in embedded storm near Pecatonica. Keeping an eye over Ogle and Lee counties, but also Carroll and Stephenson counties this morning as strong showers and embedded storms are bringing very heavy rain near Amboy and Dixon, near I-88. 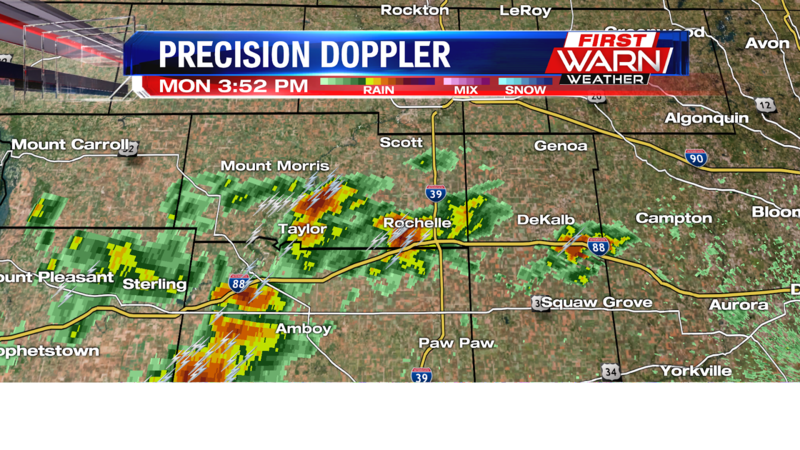 This area of storms is lifting north around 30mph and will continue to bring heavy rain and low visibility. Take it slow as you head out the door and on the road. 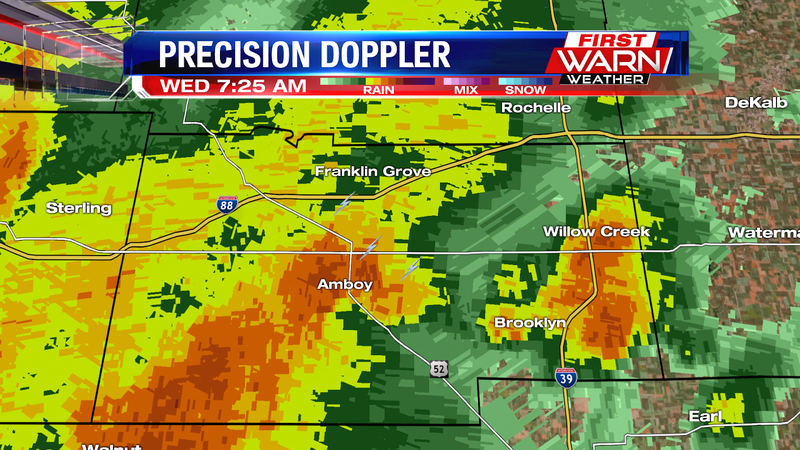 A slow moving embedded storm continues to bring very heavy rain near and just west of Amboy. 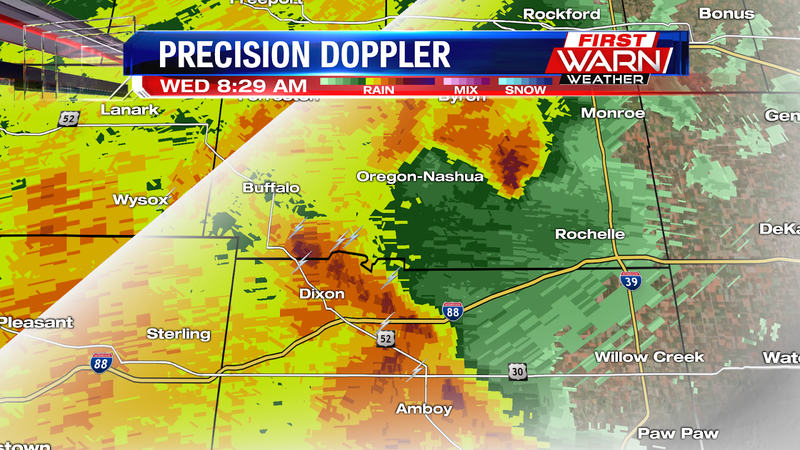 Watch for local ponding and minor flooding in this area. 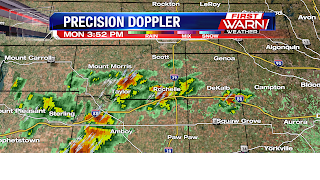 Also, a few embedded storms are moving into the Rochelle area. Embedded storm over Lee county bringing heavy rain, low visibility, and lightning. Storm will slowly lift north this morning. 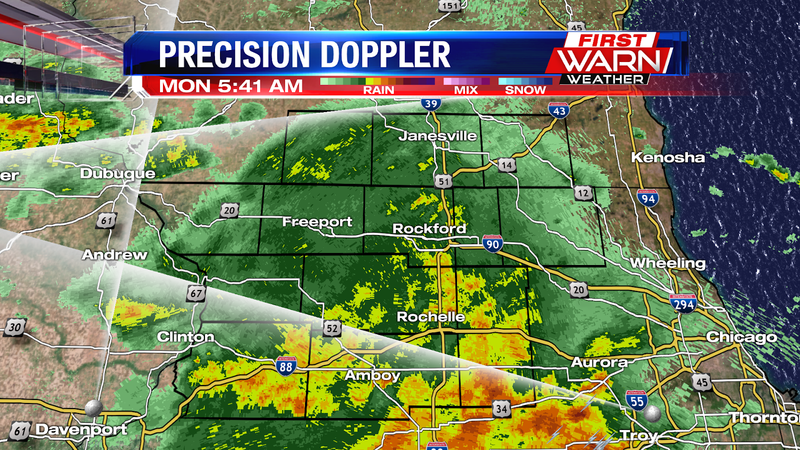 6AM radar view: Rain is beginning to pick up, turning more moderate to heavy south of Rockford. 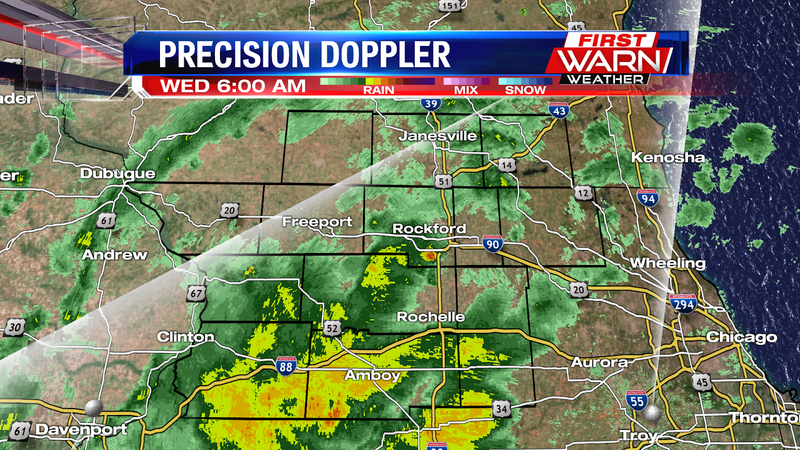 These showers will be lifting north this morning. 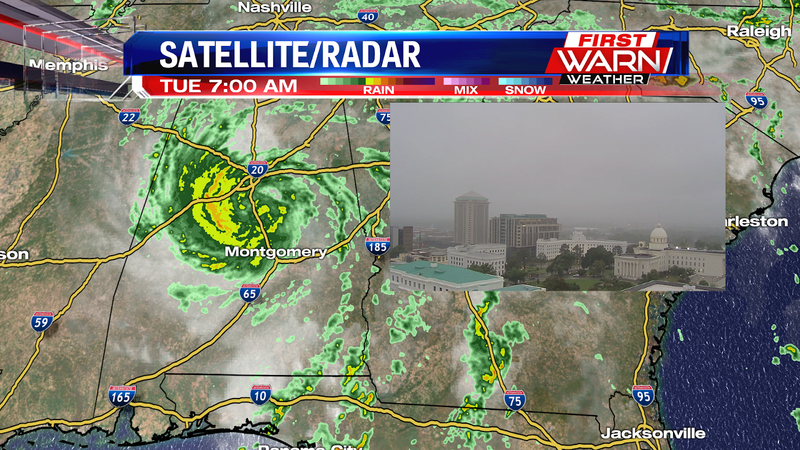 By Wednesday morning, what was Subtropical Storm Alberto, now a Subtropical Depression, is currently spinning over Montgomery, Alabama. This tight circulation is already dumping around 2-4" of rain around the Montgomery, Birmingham, and Tuscaloosa areas, with localized totals closer to 6". This storm will track north over the next day and a half, moving through Kentucky and Tennessee today, making it to southern Illinois early tomorrow morning. Areas in Tennessee and Kentucky will also pick up 2-3" of rain, over the next couple of days. 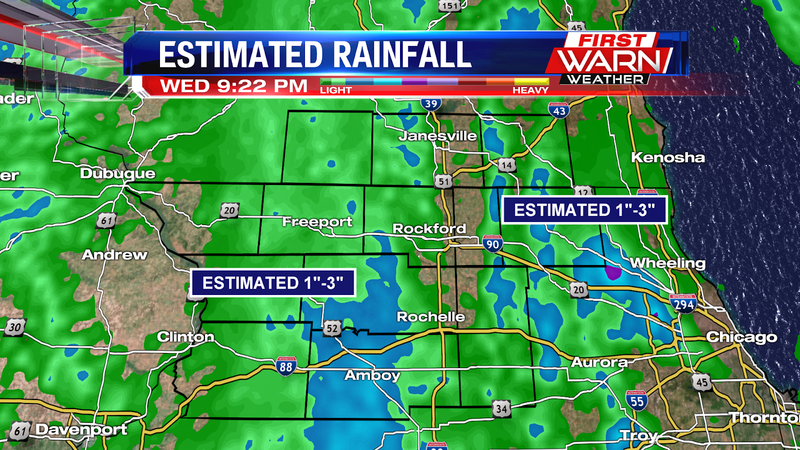 With again, a few areas seeing up near 4-5" of rain! As this system lifts near Lake Michigan through Wednesday, it will bring several round of rain showers and embedded thunderstorms across northern Illinois and southern Wisconsin. 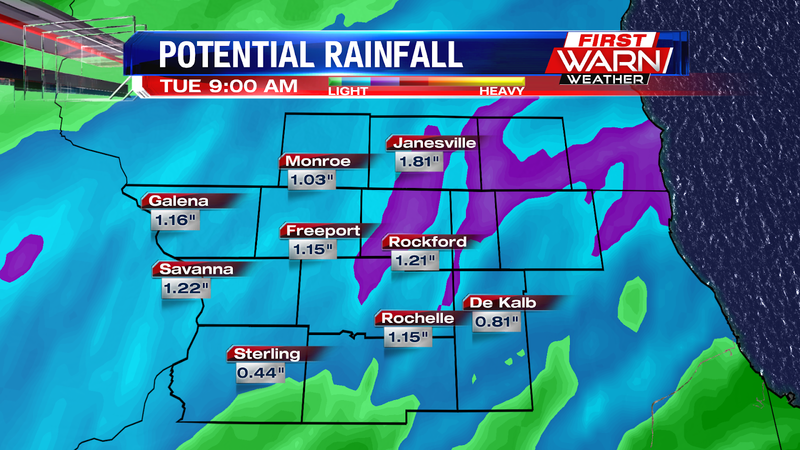 Many areas locally will see roughly 1-2" of rain, with some localized totals nearing 2.5". While instability is low tomorrow afternoon, it could be enough to bring a few embedded storms tomorrow. 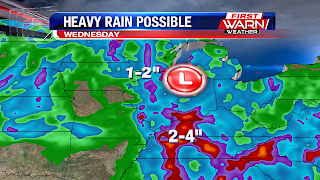 Rain will continue through Wednesday evening, before clearing the area early Thursday. 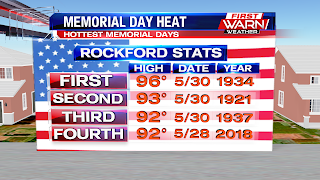 We had very warm temperatures across the Stateline today, but unfortunately the shift in winds this afternoon kept Rockford from breaking its record for the hottest Memorial Day. We hit a high of 92°, with temperatures out west being a little warmer as they were farther away from the northeasterly winds that moved in. 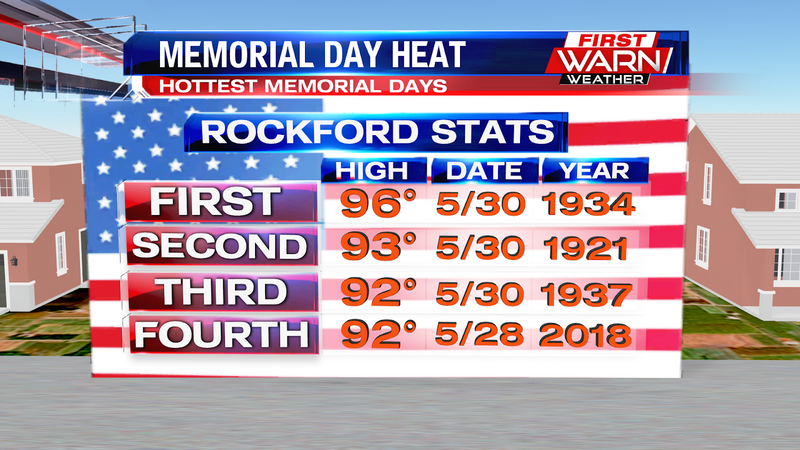 As of now, we're tied for 3rd for the hottest Memorial Day in Rockford, only one degree away from being tied for second. 1934 takes the trophy and runs home, with a high of 96° that year. Regardless, it was nice seeing a small streak of 90's in the Stateline, but sadly that'll be coming to an end after tomorrow. We'll hit the low 90's tomorrow afternoon with mostly sunny skies, before we cool down afterwards. 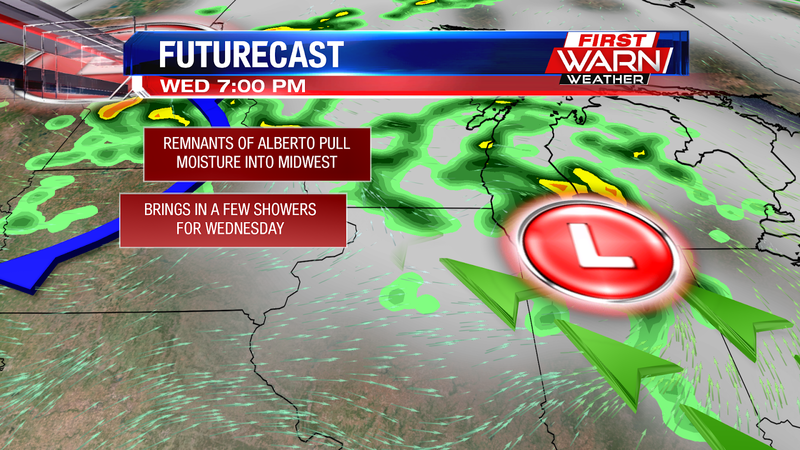 Once we get to Wednesday, the remnants of Alberto will be tracking into the Midwest. It'll pull lots of moisture into the Midwest starting late Tuesday night, increasing our cloud cover through Wednesday morning. A few isolated showers will be possible late Wednesday afternoon and evening, but the heavier rain will stay well south of us. Afterwards, we'll get another shot of heat in the upper 80's as sunshine returns Thursday afternoon, before a mid-level trough passes through heading into the weekend, which will bring us into the 70's on Saturday, and the low 80's for the start of next week. It was a hot one today across the Stateline, temperatures hitting the mid 90's! Normally we don't see temperatures like that until July, but we got an early preview of those hot summer days, and we're expected to experience the same tomorrow. As we go through this evening we'll see temperatures in the low 90's early on, before dipping to the low 80's around 9pm, eventually hitting the mid 60's during the overnight under mostly clear skies. 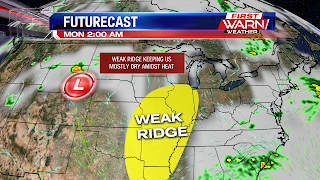 We've got this weak ridge of high pressure keeping us mostly dry this weekend, but we did see a few pop-up showers as these hot temperatures make it very easy for air to rise and form shower and thunderstorms. 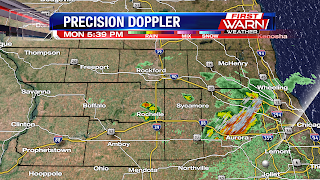 Some thunderstorms did move just south of the Stateline, but a few of us did see some sprinkles during the afternoon. 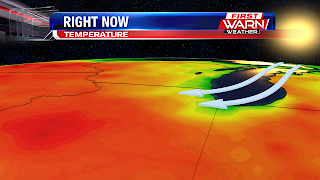 This ridge will be staying in our area for the next few days, but alongside it we've got this low pressure system out west that's causing this heat wave. 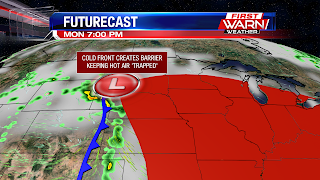 The jet stream allowed the tropical air to filter into the Midwest, and the low pressure system is keeping this hot air 'trapped' in the Midwest using the fronts as barriers. This pattern will continue until Wednesday, and by then we'll have some moisture filter into the Midwest from Alberto, which will bring us a few rain showers. The rain will help briefly cool us down into the low 80's Wednesday afternoon. Memorial Day is looking very similar to the weather we had today, except it'll be even hotter! Temperatures are expected to hit the upper 90's tomorrow afternoon, and this will end up breaking the record for the hottest Memorial Day. 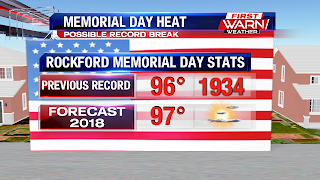 That record is currently at 96°, set back in 1934, but with how hot our temperatures have gotten even with the clouds today, the sunny skies tomorrow have a strong chance of breaching that 96° mark. Do continue to stay cautious if heading outside for the Holiday, as we're not used to these temperatures yet. Drink plenty of water, wear light-colored clothing, and give yourself easy access to shade or other cool places if need be. A pretty hot start to the holiday weekend, both Monroe and Janesville were the first to hit the 90° mark this year, with Rockford falling just a couple degrees behind in the upper 80's. Temperatures stay pretty warm in the mid 80's for the evening, but the clear skies will allow for a beautiful sunset, before cooling to the mid 70's by 10pm. Skies will stay clear for the overnight as well, where temperatures will dip to the mid 60's. Winds stay calm tonight, so it may feel a little muggy at times without the breeze. As we head into Sunday, this low pressure system out west that's part of an upper level system causing these warm temperatures, will extend a small warm front towards the Midwest. The warm front stays west of us, but the warm air will spill into the Midwest, bumping up our temperatures even further into the mid 90's by Sunday afternoon. 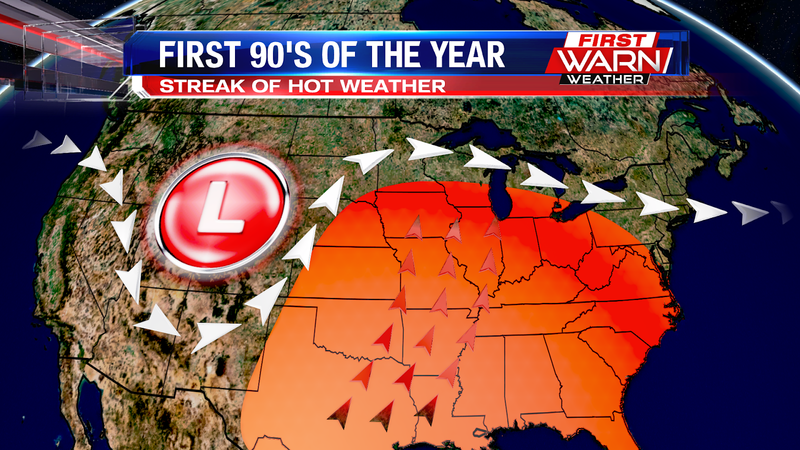 This is the pattern that'll be taking for the rest of the holiday weekend, and the cold front associated with this system will act as a barrier, keeping the hot, tropical air 'trapped' in the Midwest for the next few days. Along with hot temperatures, the heat index will be in the upper 90's for Sunday and Monday during the afternoon. Since this will be our first round of hot weather of the year, you'll definitely want to take precaution if heading outside, as we aren't used to summer-like weather yet. Keep water handy this weekend, wear light weight/colored clothing and of course allow for frequent breaks in the shade or other cool places, as the human body can become overheated quickly if out in this kind of weather for too long. It was a hot end to the work week as temperatures hit the upper 80's this afternoon. 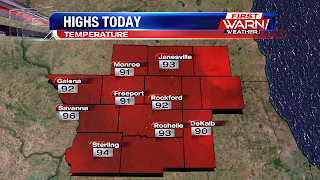 This generated a few showers and thunderstorms late afternoon, which tracked in from the southwest, and cooled our temperatures down as well. Unfortunately more storms are on the way, and we are under a Marginal Risk for severe weather with this line moving in. This line of thunderstorms is being driven by a mid-level trough to the northwest, and this will be tracking into our area late this evening. 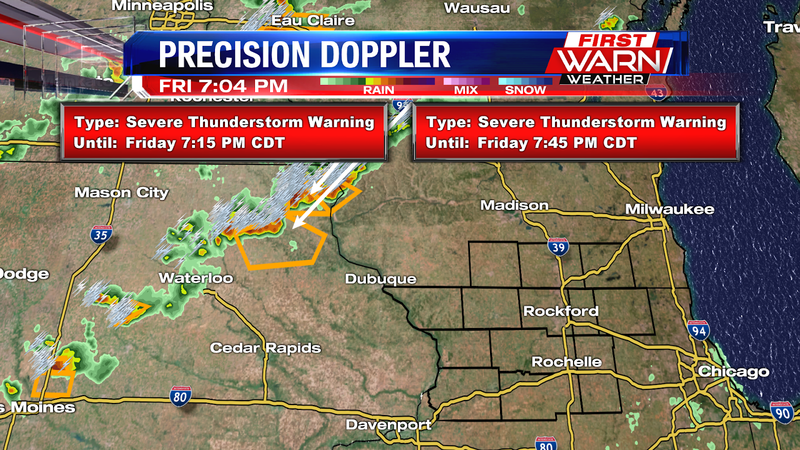 We'll see a weakening trend as these storms move towards us, as instability is much higher out in Iowa, which is why they're seeing hail and strong winds with their storms. A few strong wind gusts will still be possible when the storms arrive, but otherwise the severity of these storms will stay low. 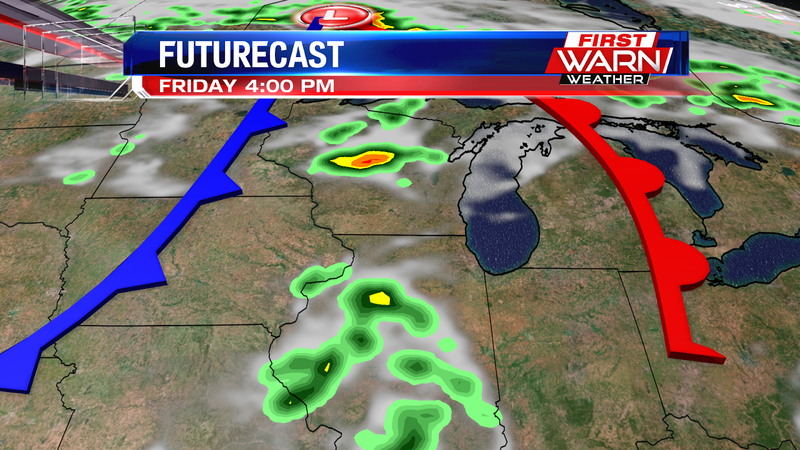 The thunderstorms move out around midnight, and we'll stay dry afterwards heading into the weekend. 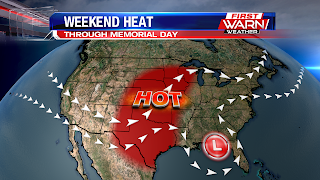 We've got some hot temperatures in store for us this Memorial Day Weekend as an upper-level trough out west has shifted the jet stream to allow for hot, tropical air to filter into the Midwest. 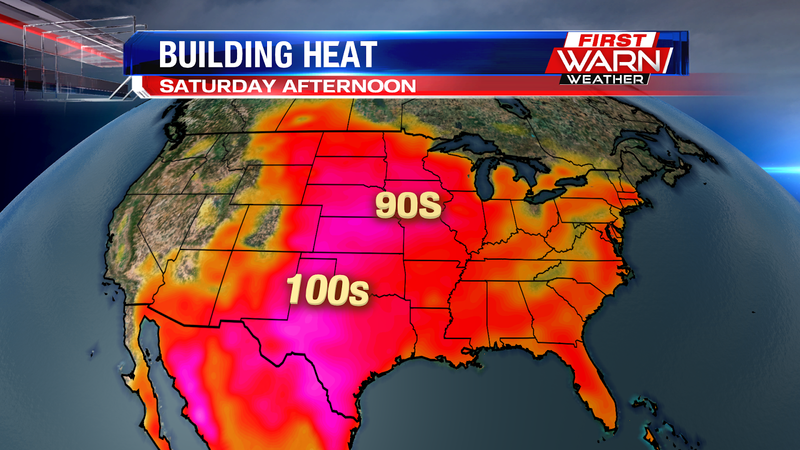 This will bring our first 90° in the Stateline on Saturday, with highs expected to be around 91°. A quick pop-up thunderstorm will be possible mid-day Saturday, but otherwise we're expected to be dry with sunny skies. Sunday will be the hottest day this weekend, hitting the mid 90's. Something to keep in mind for the weekend is that this air mass will also bring moisture, and our humidity will be fairly high throughout the weekend, so Heat Index will be a big factor, especially on Sunday. Temperatures will feel more summer-like for the holiday weekend with highs expected to warm into the upper 80's and low 90's area wide. 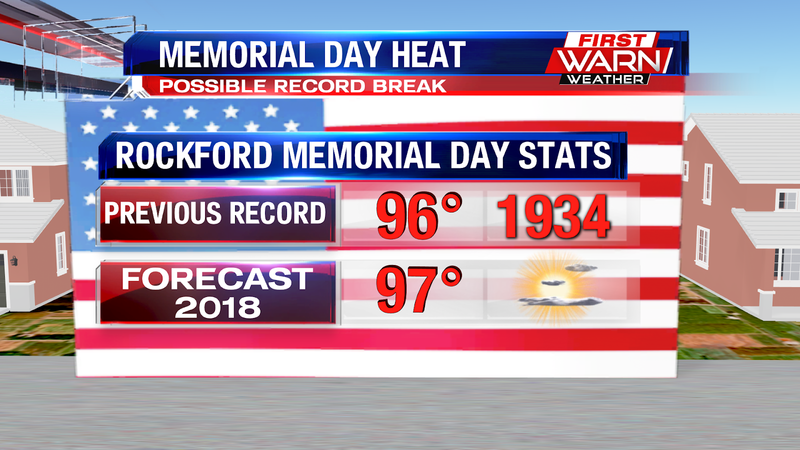 Highs on Friday won't quite make it to 90 degrees in Rockford, but could very well reach 90 degrees Saturday, Sunday and Memorial Day. While most of the weekend is expected to remain dry there are some thunderstorms that will move through Friday late afternoon and evening. The severe threat remains low but some of the stronger storms could contain hail and gusty winds during the evening and overnight. The jet stream will begin to lift back north forming a ridge of high pressure over the Midwest and Great Lakes by Sunday afternoon. 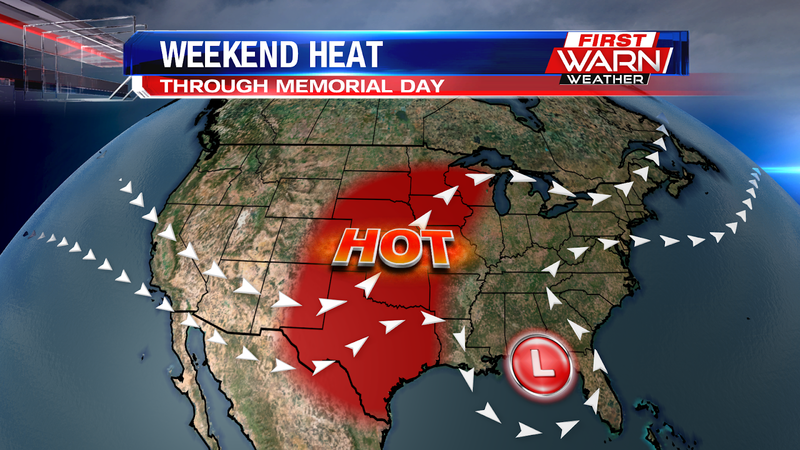 This will potentially bring temperatures up into the low 90's for Sunday and Monday. Both days will have a low thunderstorm threat. Part of the reason for the heat building back in will be the development of what could become a tropical cyclone by this weekend in the Gulf of Mexico. An area of low pressure near the Yucatan Peninsula has a high probability of further development into either a tropical depression or storm by this weekend, impacting much of Florida and the Gulf states. The arrival of this tropical system will work to buckle the jet stream back north keeping temperatures fairly mild for much of the Midwest and Great Lakes. 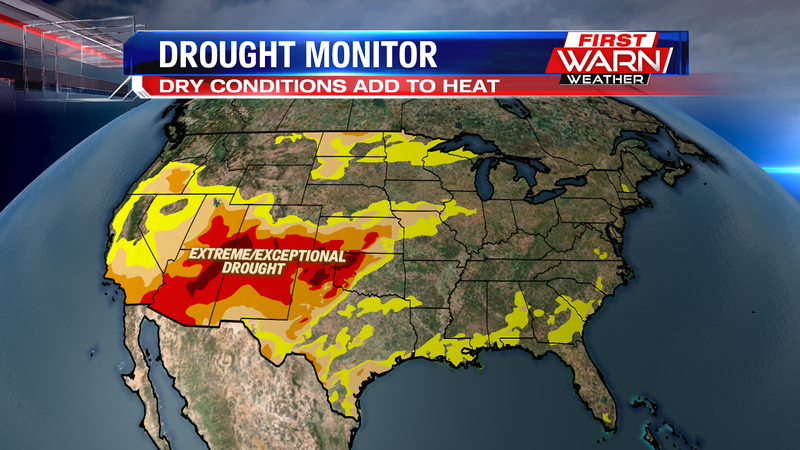 Another factor in some of the warmth this weekend is just how dry it's been over the central Plains and Southwest. 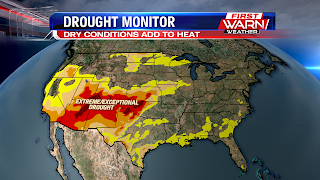 Extreme to exceptional drought conditions persist, and have been for some time. A ground with little moisture in it will heat up a lot more efficiently than a ground that has moisture. 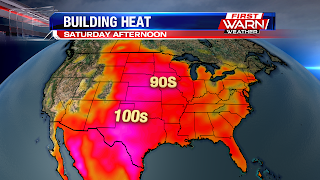 In that area, temperatures Friday and Saturday will warm into the 90's and 100's. With the middle and upper level winds coming in from the west this weekend it'll help pull some of that warmth eastward into Illinois and Wisconsin. 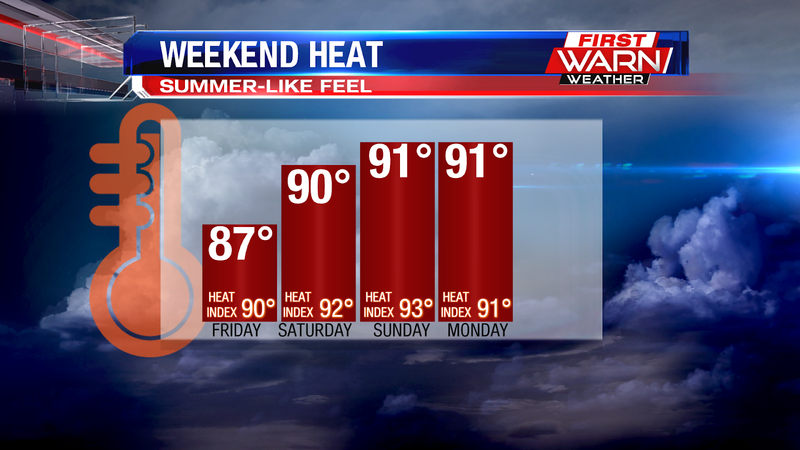 Highs on Friday will warm into the middle and upper 80's but reach the low 90's Saturday-Monday. Moisture does increase during this time which will push the heat index into the low, possibly mid, 90's by Sunday and Monday. 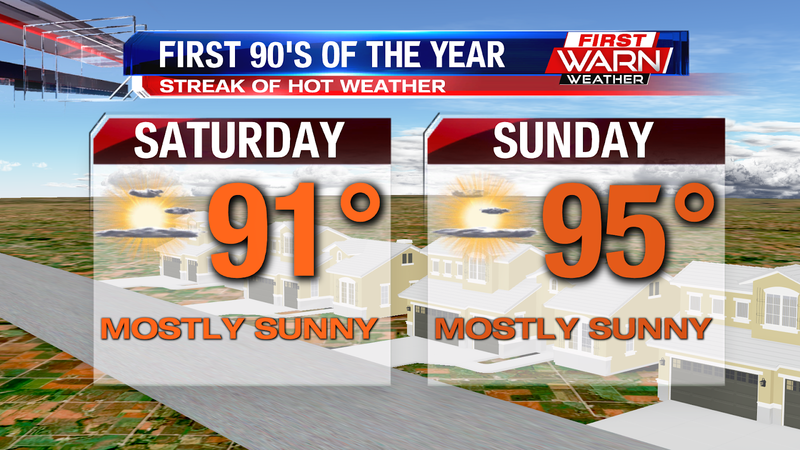 It's not going to be oppressively hot but it will be our first big heat of the season. 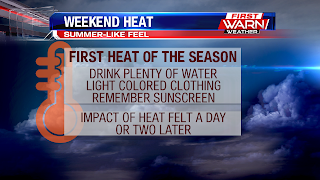 And since our bodies are not used to the heat just yet, it's important to take it easy this weekend. Especially since so many will likely be spending time outside for the holiday. We've got another summer like afternoon ahead this Thursday with highs in the mid 80's and a lot of sunshine. 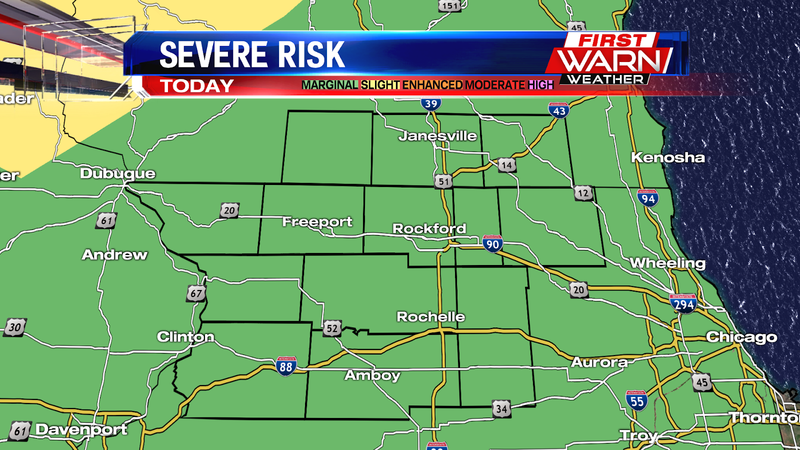 With forcing and instability remaining to the west of the area today, the storm threat remains well to the west of the Stateline. However, more moisture and instability will begin to increase across the area Friday afternoon, as a mid-level trough brings added lift to the area. This could be enough to fire up showers and storms to the west and north west of the area, and then will track east and southeast into northern Illinois. Another round of storms again looks to develop late Friday, and will track east into the area in the evening. 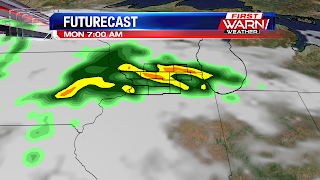 With increasing moisture and instability, and increasing forcing as well, it is possible for a few stronger storms across northern Illinois and southern Wisconsin. 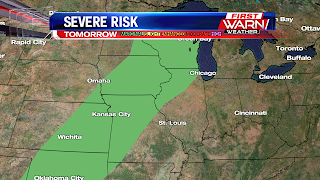 Right now the Storm Prediction Center has the area, along with portions of Missouri and Iowa under a Marginal Risk. At the moment it is a relatively low risk for us, but something to monitor for any Friday afternoon and evening plans. Make sure to check back for more updates on storm potential Friday! 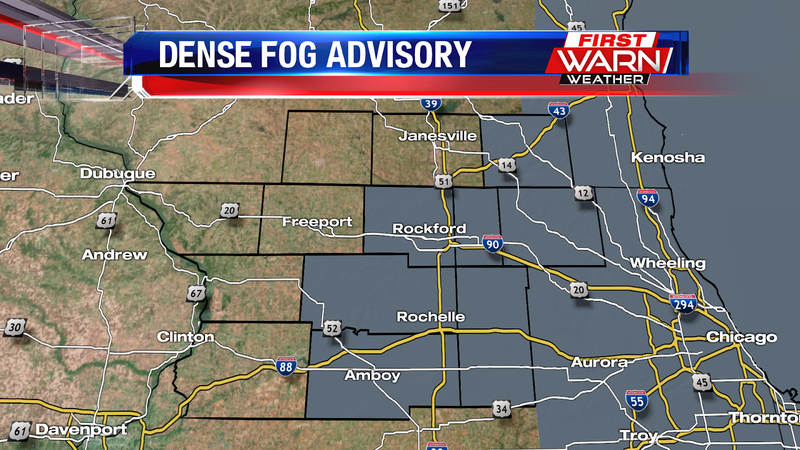 A foggy commute for many this morning with a dense fog advisory in place for the majority of the Stateline area through 10am. Visibility for some has fallen down to just a few hundred feet. Even though the sun rose early, you'll need to keep your low beams on through the late morning. Its even hard to see the Mercy Health Women and children's hospital along Riverside and I-90 with our Mercy Health Camera. 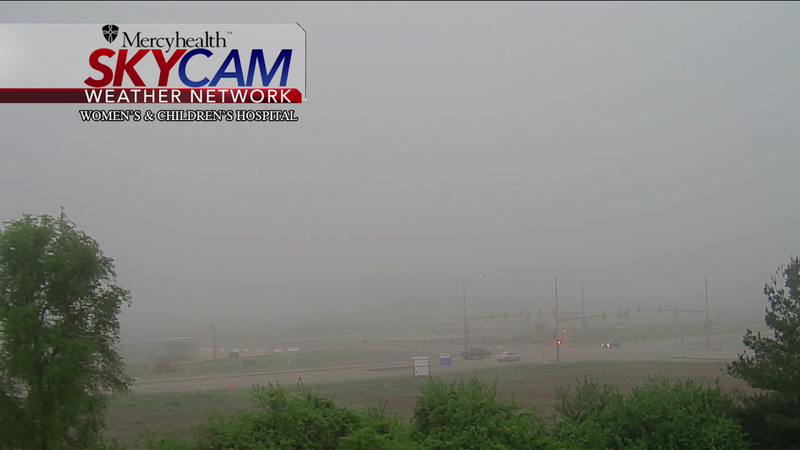 Take it slow and watch for quickly changing visibility as you head out the door. We could see some improvement though around 8-9am. A Dense Fog Advisory has been issued for Winnebago, Boone, Ogle, Lee, DeKalb and McHenry counties in northern Illinois, and for Walworth County in southeast Wisconsin through 10am Tuesday morning. 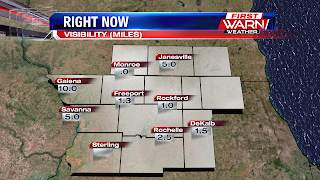 With an abundance of moisture in the atmosphere fog has quickly developed Monday evening, lowering visibility under one mile in many locations. Fog will likely last through mid-morning Tuesday and could definitely impact the commute in the morning. Take it slow and be sure to give yourself extra time Tuesday morning. Rain has been running at a surplus for the month of May with over four inches falling so far in Rockford. This puts the monthly total at a 1.83 inch surplus. 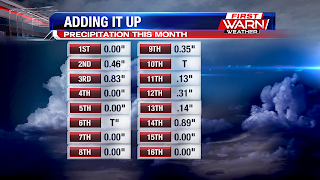 The heaviest rain came down on the 3rd and 14th of the month with over 0.80 inches falling both days. Any rain in the next couple of days will be light but thunderstorm chances do return by the end of the week and for Memorial Day weekend. No one day looks like a total washout, however, and there will most likely be many dry hours through Memorial Day. The rain was heavy Monday morning adding up between 0.5 and 1.0 inches for most in northern Illinois. 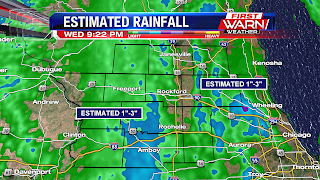 Flooding, however, did occur closer to Chicago where rain totals reached 1.5 inches. Rain showers have turned to mostly drizzle Monday evening as drier air moves in from the southwest. 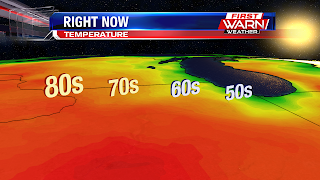 Cloud cover has even started to break up over west-central Illinois and temperatures have warmed into the low 70's. evening with skies remaining cloudy through Tuesday morning. 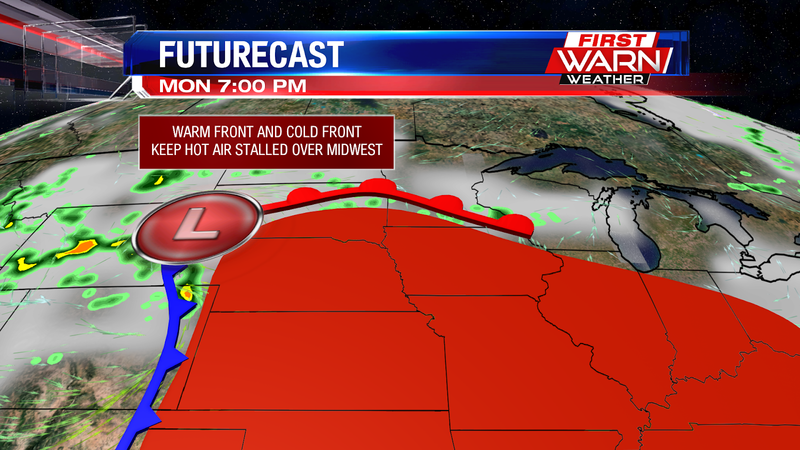 Isolated showers are possible overnight as an area of low pressure moves from Iowa into Wisconsin. And with the recent heavy rain and an abundance of moisture in the atmosphere, fog will also be possible early Tuesday. Rain showers, with minimal thunder have been lifting to the northeast this morning. A mid-level wave, moving north of our upper low, has triggered showers and storms over central portions of the state. As the complex lifts north, its outrunning the instability found to our south, and its why so far we've had minimal thunder and lightning coverage over the Stateline. 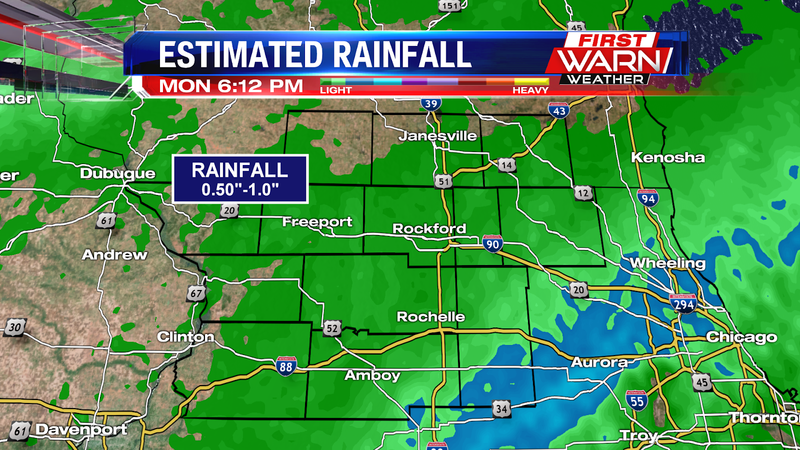 So far radar estimated around .25"-.75" of rain that's fallen, with isolated amounts closer to 1". Coverage of rain will die down closer to if not before the lunch time hour, with then widely scattered to isolated chances afternoon. The higher threat for storms to develop this afternoon will be to our south over eastern Illinois, in the warm sector of the system. This is south of the warm front where temperatures will be climbing up through the 70's. With some clearing of the cloud cover storms look to redevelop in this area. We keep just a small chance for rain in the afternoon. 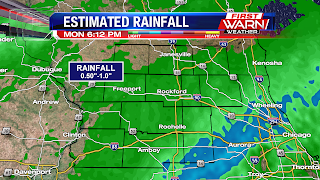 Following heavy rain and embedded thunderstorms Sunday morning most of the afternoon and evening remained dry. Temperatures were cool - only reaching the mid and upper 50's Sunday afternoon. Thunderstorms have developed near St. Louis, MO ahead of an area of low pressure. 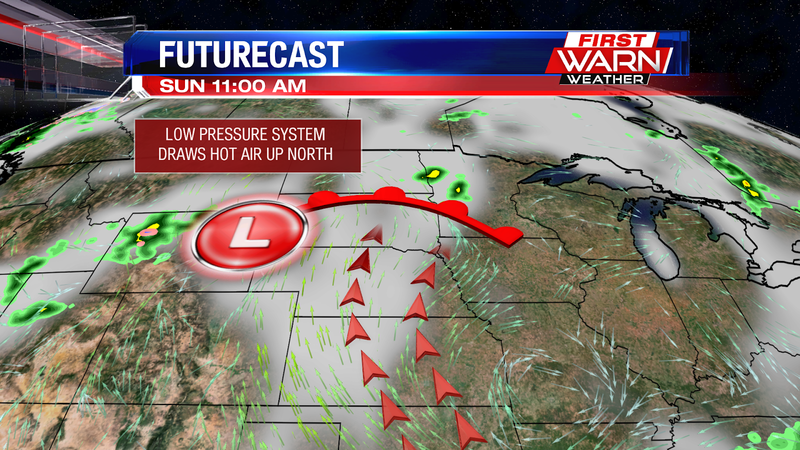 That low will move northward into Illinois by Monday morning. 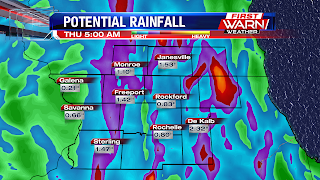 Rain will begin to fall over northern Illinois from the southwest by 4am, with most experiencing rain by 6am. Rain could become heavy at times after 7am with a few embedded thunderstorms possible. Instability remains very low during the morning so no severe weather is anticipated. The low will pass to the east by Monday afternoon but a few lingering showers will be possible through Monday evening. 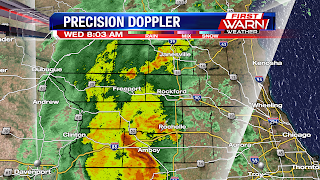 The heaviest fell over far northern Illinois - from parts of Jo Daviess, Carroll, Stephenson and Winnebago counties - where radar estimated totals were anywhere from one to two inches. 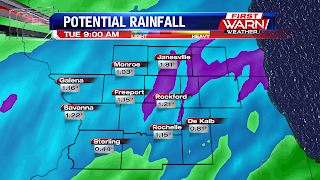 An additional half an inch, up to one inch of rain will be possible through Monday evening. 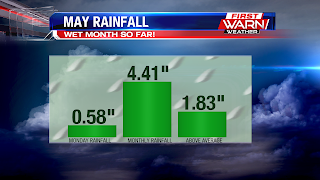 Already the month of May has received over three and a half inches, putting Rockford almost an inch and a half above our monthly normal. 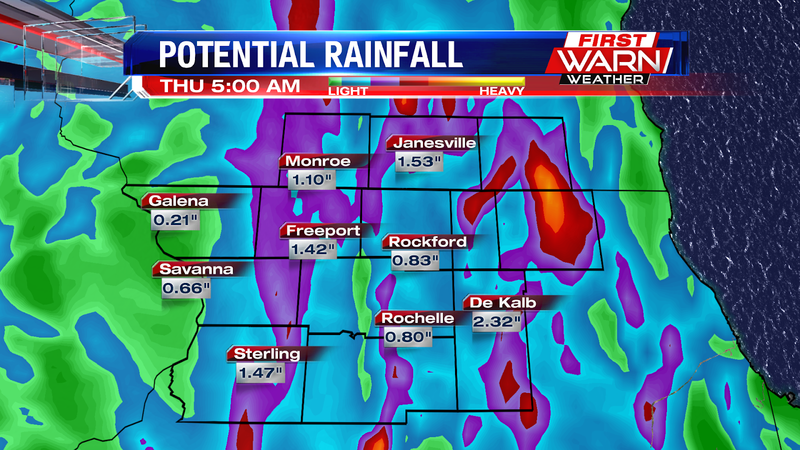 With possible another inch of rain coming through Monday morning minor flooding may become a concern. 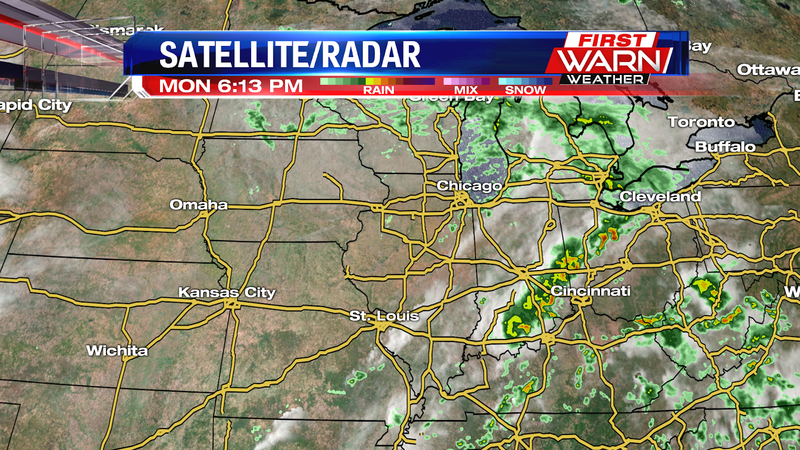 Another round of rain and thunder returns tonight lifting in from Iowa. The severe weather threat is well south to the area through the evening, with generally showers and a rumble of thunder or two. Rain will increase in coverage tonight into tomorrow late morning. While most of the rain will move out by late morning Sunday, it will still be a cooler and damp day with a cold front stalled over central Illinois. Highs will struggle to make it to the 60's for the afternoon, with periods of drizzle lasting into the afternoon. Another round of showers and storms arrives late Sunday, but mainly into Monday morning, lasting through the commute time. We should finally start to dry out by the late afternoon on Monday. A weak cool front came in from the northeast Thursday afternoon, shifting winds around to the northeast and reinforcing a cooler air mass over northeast Illinois and southeast Wisconsin. 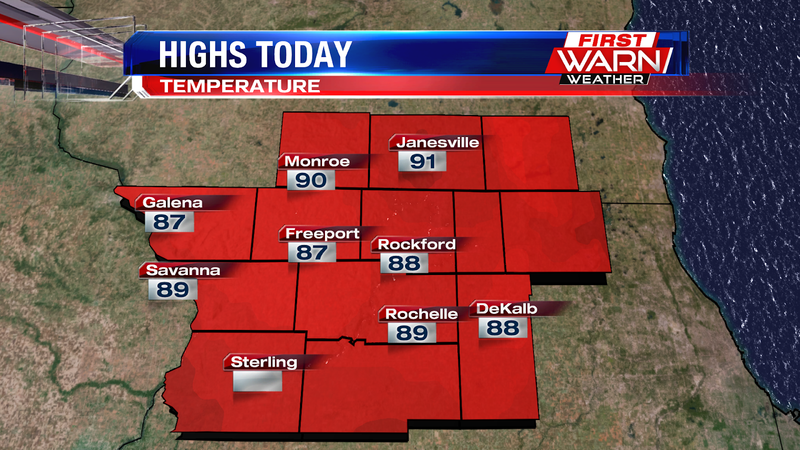 Highs on Thursday warmed to 79 degrees in Rockford, the low 80's west of Rockford and the low 70's to the east. Michigan water temperatures are in the upper 40's, to right around 50 degrees. Since it's still relatively 'cool' a wind from either the east or northeast will help provide a natural cooling effect for those living along the lake shore. Sometimes the lake breeze can spread west for quite a distance, like it did on Tuesday. 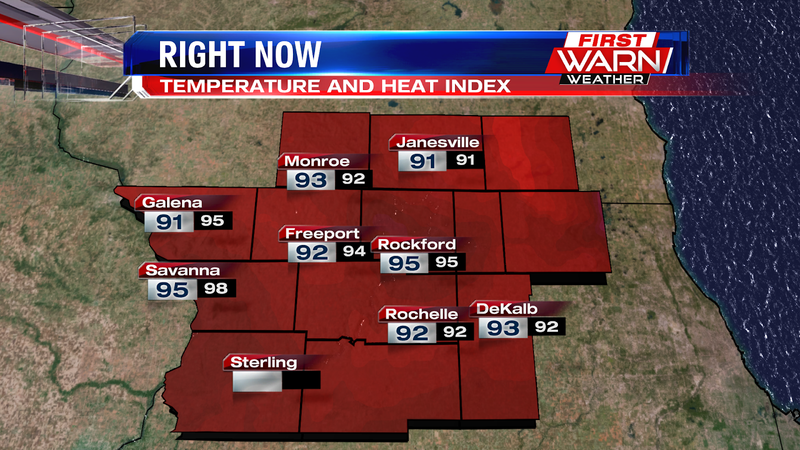 The lake breeze made it all the way past Rockford and Janesville! It didn't really cool us off, but it the wind direction did shift to the east Tuesday evening. Winds will remain from the east/northeast for the next couple of days and this will keep areas like Chicago and Milwaukee a little cooler than places further inland. Highs for us will reach the mid and upper 70's. Cloud cover Friday and Saturday will have more of an impact on our temperatures those days than the wind off of Lake Michigan. The forecast for the rest of this week remains dry with high pressure anchored nearby and the jet stream split to our north and south. It will be nice to finally dry out after a soggy start to our month. Its about 50/50 on wet vs dry days for the first two weeks of the month. Many of those rainy days were caused by a stationary boundary that was in place for several days last week, through the weekend, and the beginning of this week. 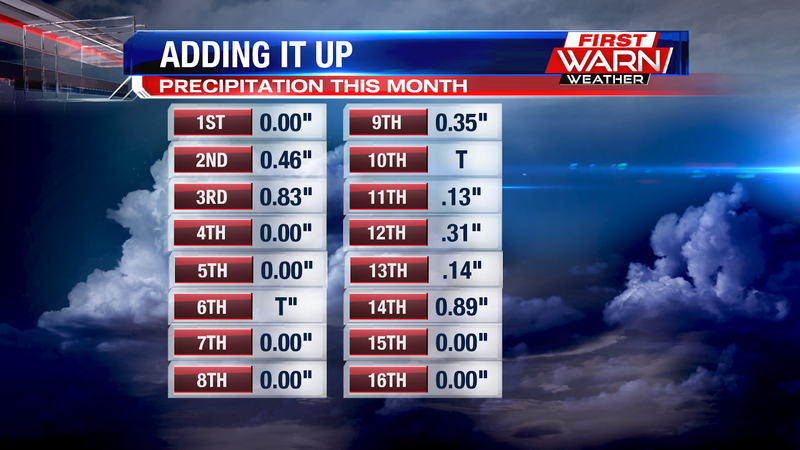 So far this month we've picked up 3.11" of rain, which brings us near double the average for this point in the month. The average is around 1.76", with our surplus nearing 1.35". 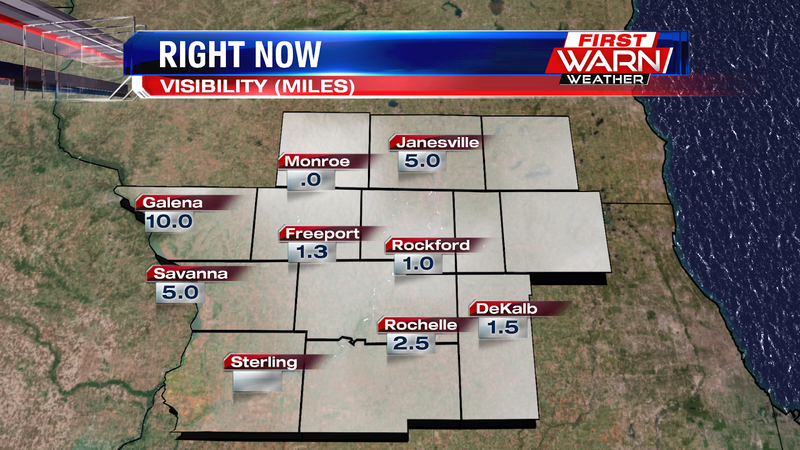 While Rockford on Monday received 0.89" there were some that received 1-3"! Our next round of rain arrives Saturday night. 9:45pm Update: A Severe Thunderstorm Warning had been issued for parts of Ogle, Lee and DeKalb counties earlier Monday evening. The storm quickly strengthened as it moved into DeKalb County, likely producing strong wind gusts south of Malta and DeKalb. 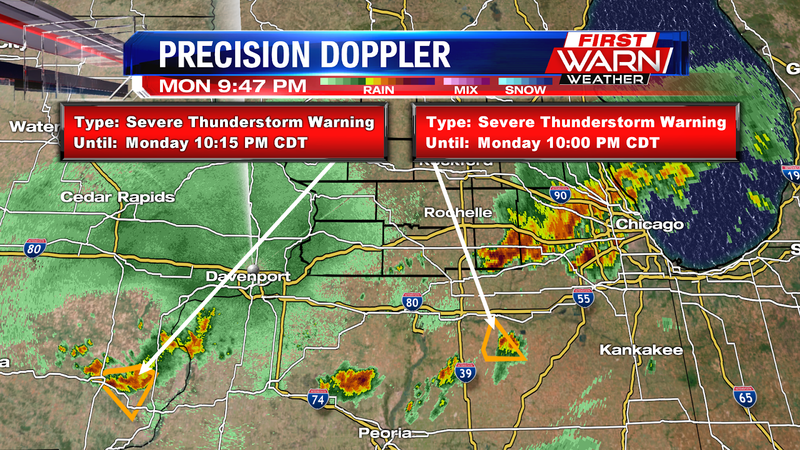 The Severe Thunderstorm Warning has expired as the storm has fallen below severe limits. 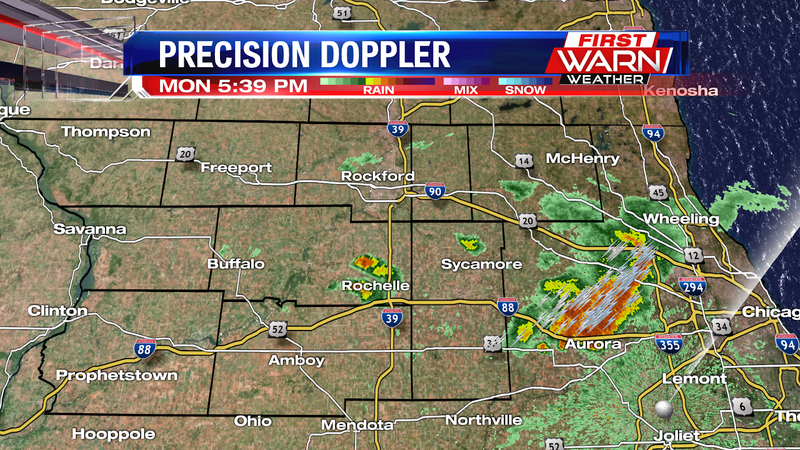 Additional thunderstorms continue to develop over southeast Iowa and central Illinois along a stationary boundary. This will likely be the focus for additional thunderstorms during the overnight. 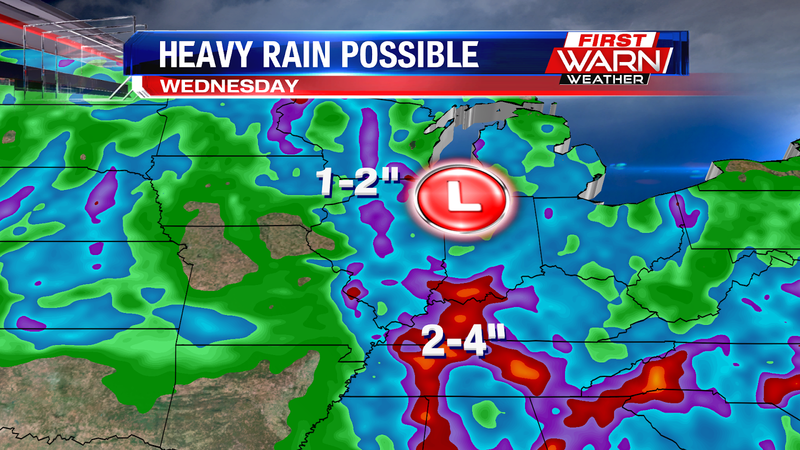 Heavy rainfall will be our biggest concern. 7:15pm Update: The bulk of the storm activity is done but isolated showers and thunderstorms are still likely as the atmosphere holds on to a little instability through the evening. 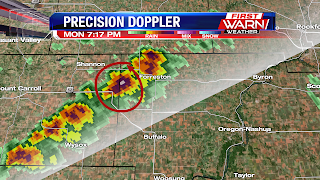 A line of showers and thunderstorms have developed from near Forreston, southwest into Carroll County. 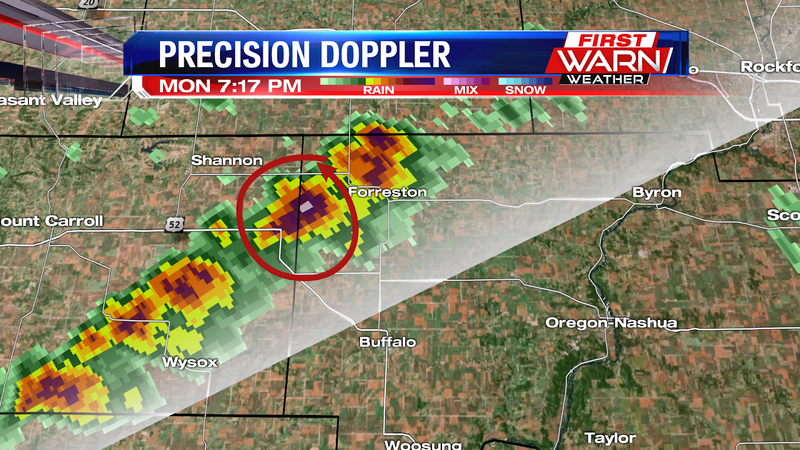 The storm cell just southwest of Forreston could contain smaller hail with it. These storms are moving to the east/northeast. 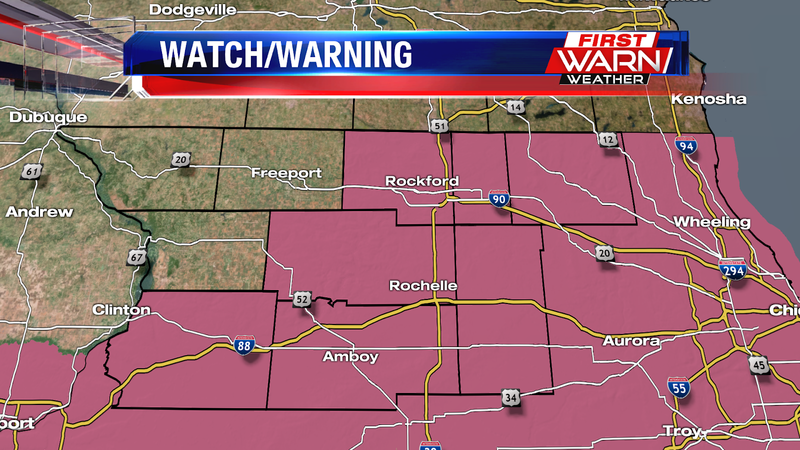 6:05pm Update: Just in: The Severe Thunderstorm Watch has been canceled for northern Illinois. While a few isolated showers/storms may continue for the next hour or two, the threat for severe weather continues to decrease this evening. 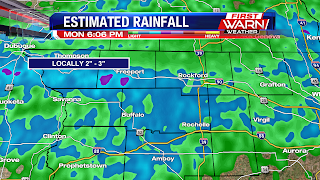 The image on the left shows estimated rainfall totals from storms earlier Monday morning and afternoon. 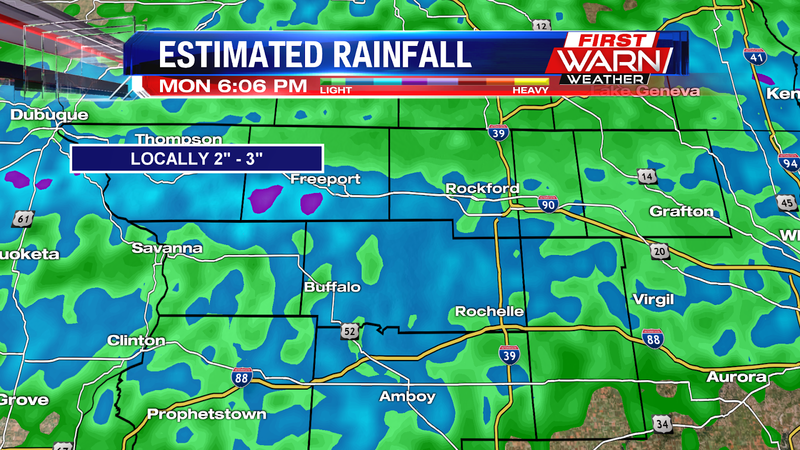 Locally 2-3 inches of rain came down over far NW Illinois before sunrise. Most of the thunderstorms Monday afternoon missed northwest Illinois. 5:30pm Update: Severe Thunderstorms developed mostly south of Rockford Monday afternoon in an area that had developed better instability. 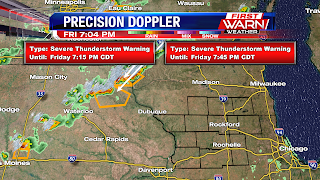 Severe Thunderstorm Warnings were issued for Lee and DeKalb counties, but have since expired as those storms have moved well east of the area. The storm over DeKalb County did show some mid-level rotation, but with the environment not supportive of tornadoes the storm likely produced large hail and even a possible wet microburst. There are some additional light showers developing over Rochelle, but our severe threat will be decreasing through the evening. 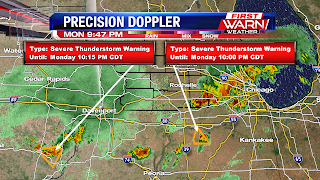 A Severe Thunderstorm Watch has been issued for Winnebago, Boone, Ogle, Lee, DeKalb, McHenry and Whiteside counties until 10pm Monday evening. 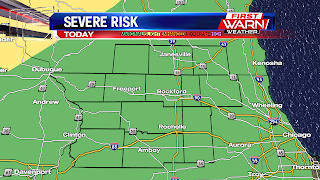 Thunderstorms have developed southwest of Rockford Monday afternoon, closer to where a warm frontal boundary is located. Instability has increased quite a bit over Ogle, DeKalb and Lee counties this afternoon. Thunderstorms capable of large hail, strong winds and heavy rainfall will be likely through roughly 7pm-9pm. Storm threat will then shift east into the early overnight before additional rain showers/embedded thunder will be possible.